The Sign of the Black Rock by Scott Chantler. A Three Thieves Book. Review: There are many books about thieves, right? True, however, none of the thieves are like the ones we deal with in this story. These thieves are not the parkour action escape type. These thieves are actually much nicer ones. Scott Chantler has written an eye capturing graphic novel that will be good for a wide range of kids and adults. It is a fun and exciting read for a diverse group of people. The Sign of the Black Rock is the second book in the Three Thieves series. The main characters are the Three Thieves (a girl - Dessa, a norker-a small grumpy creature, and fisk- a very large and strong creature), and an innkeeper. After attempting to steal from the queen's treasury, the 3 thieves, now fugitives are on the run to avoid being caught. It won't be too easy with the queen's dragons after them. They are even offering a "reward" for them. Eventually, they find themselves trapped. That happens after someone tricks them and they do not have Fisk to help them. The innkeeper does not really care for his wife Eudora, and puts her in charge of watching over the thieves but she and Dessa become friends. With dragons after them, escape is far away, but at the same time much closer than they think. This book is filled with suspense which is one of the many things I enjoyed about this book. You never know what is going to happen next as the 3 fugitives are on the run to safety. The highlight of the book is definitely the suspense because for the most part you don't know what will happen next. Dessa has something "valuable" that was taken. She wants "it" so badly that she has to escape in order to get it. There are only a few negative parts about this novel which actually do not have to do with the storyline. An example of this is that the name of the book does not have anything to do with the story itself, so that kind of threw me off. A title I would suggest for this story is Thieves on the Run . This addition to the first book in the series is an attention-grabbing read. I recommend it to anyone 9-13 who is looking for a fascinating and fun, relaxing read. Overall, I feel this book is well written and entertaining. I rate it a solid 7 out of 10.
Review written by Sahil (7th grade student). We would like to thank Raab Associates for providing a copy of The Sign of the Black Rock for this review. 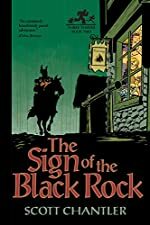 Have you read The Sign of the Black Rock? How would you rate it?